Enlarged thyroid glands (ie, goiters) often extend in the mediastinum posterior to the sternum, making the gland, by definition, a substernal (or retrosternal) goiter. 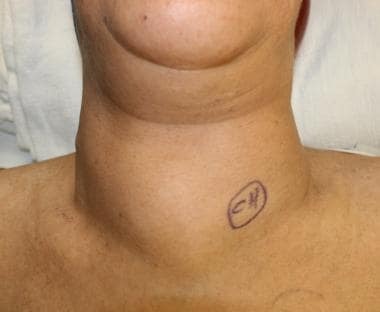 [1, 2, 3, 4, 5, 6, 7, 8, 9] When this occurs, thyroidectomy surgery (excision of part or all of the thyroid gland) has unique considerations that are important to understand for the surgeon and patient. This article reviews substernal goiter and focuses on substernal thyroidectomy. 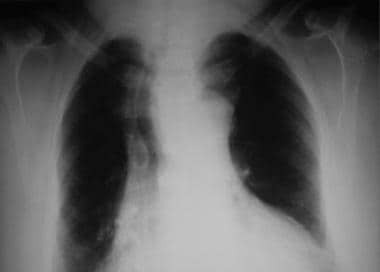 Chest radiograph of substernal goiter with tracheal deviation to the right. The identification of substernal extension of an enlarged thyroid gland itself is generally an indication for surgery. [1, 2, 32, 33, 9, 3, 34] Many authors advocate surgical removal of substernal goiters, even when asymptomatic, for the reasons discussed below. First, substernal goiters are highly likely to continually grow, leading to the development of compressive symptoms (rarely, but possibly, emergent). In addition, such goiters become increasingly difficult to excise with further growth over time. CT scan of substernal goiter with tracheal compression. If lymph nodes appear suspicious on preoperative imaging, FNA biopsy or intraoperative biopsy of the lymph nodes is warranted. The presence of symptoms is another indication for substernal thyroidectomy. Compressive symptoms, as described above, are often enough to motivate a patient to seek attention and possibly request surgery. Although approximately 85% of goiters are euthyroid, a minority cause symptoms related to hyperthyroidism (eg, palpitations, irregular or rapid heart rates, weight loss, increased heat sensitivity, insomnia, nervousness, tremulousness, diarrhea) or even hypothyroidism (eg, fatigue, weight gain, increased cold sensitivity, depression, constipation, brittle hair). Thyrotoxicity (hyperthyroidism) in goiters may result from an autonomously functioning nodule or may be precipitated by intake of iodides found in certain expectorants or in radiographic contrast media. Hyperthyroidism requires preoperative medical management to avoid thyroid storm perioperatively. 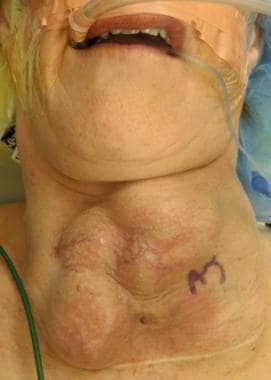 Photograph showing a goiter as a noticeable bilateral anterior inferior neck mass. Rarely, the Pemberton sign (raising hands induces facial flushing, dilated neck veins, and even stridor from compressive effects of goiter) is an indication for a substernal thyroidectomy. Close observation may be appropriate for substernal goiters that are small, without symptoms, without radiographic evidence of visceral or vascular compromise, and/or when found in a patient of advanced age or at high surgical risk. Surgeons and medical physicians, in cooperation with the patient, must weigh the risks of surgery and general anesthesia with the presence of symptoms or the possible impending dangers of mass effect of a substernal goiter. Along with a full neck examination, the physical examination (see image below) should include an assessment for the Chvostek sign (found in 10% of cases at baseline when eucalcemic) to determine if this reflex may be used to assess possible postoperative hypocalcemia. Photograph showing a goiter as an extensive neck mass suggestive of malignancy. TSH and FT4 are used to assess thyroid hormone production and the need for preoperative treatment of hyperthyroidism or thyroid hormone replacement in cases of hypothyroidism. Calcium, with albumin correction, and PTH can help predict the need for calcium (and vitamin D) replacement after thyroidectomy. If CT scanning is performed, a scan without contrast is recommended by many. The iodine contained in contrast agents can reduce the uptake and efficacy of postoperative radioactive iodine used in addition to thyroidectomy for the treatment of thyroid malignancy. Iodinated contrast can reduce the efficacy of radioactive iodine for up to 6 months. Ultrasonography is often an integral and recommended component of thyroid evaluation because of its detailed imagery, potential for directed biopsies, minimal risk profile, and lower cost. However, ultrasonography is not capable of visualizing substernal components of the thyroid gland because the bones of the chest (clavicles, ribs, manubrium, sternum) block the transmission of acoustic information. Chest radiography and iodine-123 (I123) nuclear medicine scans can show a substernal goiter, but without much anatomic detail of the gland or the surrounding structures. Barium esophagraphy may show indentation and deviation of the esophagus, suggesting a certain length of substernal goiter causing mass effect. However, the usefulness of esophagraphy is limited given its inability to accurately confirm a thyroid mass because of poor anatomic detail. Overall, complications of substernal thyroidectomy are rare (< 5%). [1, 29, 26, 43] Effective, safe, and sterile surgical technique is important for minimizing the possible complications of substernal thyroidectomy (bleeding, hematoma, infection, hypoparathyroidism/hypocalcemia, injury to the external branch of the superior laryngeal nerve, and/or recurrent laryngeal nerve injury) and midline sternotomy (hematoma, seroma, mediastinitis/abscess/osteomyelitis, chest bone fracture, sternum shift/disfigurement or dehiscence, pneumothorax/pneumomediastinum). Appropriate use of a midline sternotomy by a surgeon trained to do so is important. Prediction, identification, and treatment of postoperative hypoparathyroidism and hypocalcemia are important for the safety of the patient. Physicians should educate patients concerning the need (or possible need in the case of thyroid lobectomy surgery) for daily thyroid hormone supplementation and possible future necessary dose adjustments. To reduce the risks of continued hyperthyroidism, including the development of perioperative thyroid storm (acute, life-threatening elevations of thyroid hormone levels), surgeons, primary care physicians, internists, endocrinologists, and anesthesiologists should work to identify hyperthyroidism preoperatively, to reduce the hormone effects and production with medications such as beta-blockers and possibly antithyroid thioamides (propylthiouracil and methimazole), and to have medications (beta-blockers, propylthiouracil, sodium iodine, corticosteroids) available during and after the operation to reduce acute effects. If signs of thyroid storm develop during substernal thyroidectomy, the surgical team should halt the surgical procedure. With total thyroidectomy for bilateral goiter, the risk of recurrence is virtually zero. Thyroid lobectomy and cases in which a thyroid cancer is excised carry the risk of recurrent disease depending on the extent and stage of each disease. Abboud B, Sleilaty G, Mallak N, Abou Zeid H, Tabchy B. Morbidity and mortality of thyroidectomy for substernal goiter. Head Neck. 2010 Jun. 32(6):744-9. [Medline]. Katlic MR, Wang CA, Grillo HC. Substernal goiter. Ann Thorac Surg. 1985 Apr. 39(4):391-9. [Medline]. Shin JJ, Grillo HC, Mathisen D, et al. The surgical management of goiter: Part I. Preoperative evaluation. Laryngoscope. 2011 Jan. 121(1):60-7. [Medline]. White ML, Doherty GM, Gauger PG. Evidence-based surgical management of substernal goiter. World J Surg. 2008 Jul. 32(7):1285-300. [Medline]. Raffaelli M, De Crea C, Ronti S, Bellantone R, Lombardi CP. Substernal goiters: incidence, surgical approach, and complications in a tertiary care referral center. Head Neck. 2011 Oct. 33(10):1420-5. [Medline]. Netterville JL, Coleman SC, Smith JC, Smith MM, Day TA, Burkey BB. Management of substernal goiter. Laryngoscope. 1998 Nov. 108(11 Pt 1):1611-7. [Medline]. 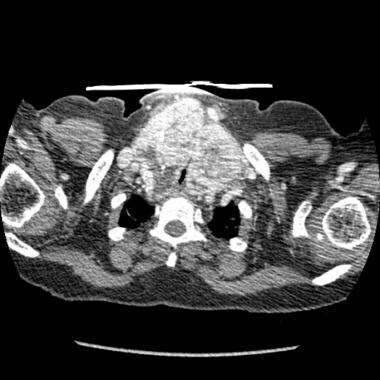 Page C, Strunski V. Cervicothoracic goitre: an anatomical or radiological definition? Report of 223 surgical cases. J Laryngol Otol. 2007 Nov. 121(11):1083-7. [Medline]. Singh B, Lucente FE, Shaha AR. Substernal goiter: a clinical review. Am J Otolaryngol. 1994 Nov-Dec. 15(6):409-16. [Medline]. Rios A, Rodriguez JM, Balsalobre MD, Tebar FJ, Parrilla P. The value of various definitions of intrathoracic goiter for predicting intra-operative and postoperative complications. Surgery. 2010 Feb. 147(2):233-8. [Medline]. Sanders LE, Rossi RL, Shahian DM, Williamson WA. Mediastinal goiters. The need for an aggressive approach. Arch Surg. 1992 May. 127(5):609-13. [Medline]. Shaha AR, Alfonso AE, Jaffe BM. Operative treatment of substernal goiters. Head Neck. 1989 Jul-Aug. 11(4):325-30. [Medline]. Mercante G, Gabrielli E, Pedroni C, et al. CT cross-sectional imaging classification system for substernal goiter based on risk factors for an extracervical surgical approach. Head Neck. 2011 Jun. 33(6):792-9. [Medline]. Casella C, Pata G, Cappelli C, Salerni B. Preoperative predictors of sternotomy need in mediastinal goiter management. Head Neck. 2010 Sep. 32(9):1131-5. [Medline]. Randolph GW. The importance of pre- and postoperative laryngeal examination for thyroid surgery. Thyroid. 2010 May. 20(5):453-8. [Medline]. Prades JM, Dumollard JM, Timoshenko A, et al. Multinodular goiter: surgical management and histopathological findings. Eur Arch Otorhinolaryngol. 2002 Apr. 259(4):217-21. [Medline]. Derwahl M, Studer H. Nodular goiter and goiter nodules: Where iodine deficiency falls short of explaining the facts. Exp Clin Endocrinol Diabetes. 2001. 109(5):250-60. [Medline]. Gaitan E. Goitrogens in food and water. Annu Rev Nutr. 1990. 10:21-39. [Medline]. Derwahl M, Studer H. Multinodular goitre: 'much more to it than simply iodine deficiency'. Baillieres Best Pract Res Clin Endocrinol Metab. 2000 Dec. 14(4):577-600. [Medline]. Wychulis AR, Payne WS, Clagett OT, Woolner LB. Surgical treatment of mediastinal tumors: a 40 year experience. J Thorac Cardiovasc Surg. 1971 Sep. 62(3):379-92. [Medline]. Brix TH, Hegedüs L. Genetic and environmental factors in the aetiology of simple goitre. Ann Med. 2000 Apr. 32(3):153-6. [Medline]. NCCN (National Comprehensive Cancer Network) Guidelines. Thyroid Carcinoma. 2011. Reeve TS, Rubinstein C, Rundle FF. Intrathoracic goitre: its prevalence in Sydney metropolitan mass radiography surveys. Med J Aust. 1957 Aug 3. 44(5):149-56. [Medline]. Rundle FF, De Lambert RM, Epps RG. Cervicothoracic tumors: a technical aid to their roentgenologic localization. Am J Roentgenol Radium Ther Nucl Med. 1959 Feb. 81(2):316-21. [Medline]. Sand ME, Laws HL, McElvein RB. Substernal and intrathoracic goiter. Reconsideration of surgical approach. Am Surg. 1983 Apr. 49(4):196-202. [Medline]. Vadasz P, Kotsis L. Surgical aspects of 175 mediastinal goiters. Eur J Cardiothorac Surg. 1998 Oct. 14(4):393-7. [Medline]. Torre G, Borgonovo G, Amato A, et al. Surgical management of substernal goiter: analysis of 237 patients. Am Surg. 1995 Sep. 61(9):826-31. [Medline]. Huins CT, Georgalas C, Mehrzad H, Tolley NS. A new classification system for retrosternal goitre based on a systematic review of its complications and management. Int J Surg. 2008 Feb. 6(1):71-6. [Medline]. Rodriguez JM, Hernandez Q, Piñero A, Ortiz S, Soria T, Ramirez P, et al. Substernal goiter: clinical experience of 72 cases. Ann Otol Rhinol Laryngol. 1999 May. 108(5):501-4. [Medline]. Erbil Y, Bozbora A, Barbaros U, Ozarmagan S, Azezli A, Molvalilar S. Surgical management of substernal goiters: clinical experience of 170 cases. Surg Today. 2004. 34(9):732-6. [Medline]. Gittoes NJ, Miller MR, Daykin J, Sheppard MC, Franklyn JA. Upper airways obstruction in 153 consecutive patients presenting with thyroid enlargement. BMJ. 1996 Feb 24. 312(7029):484. [Medline]. [Full Text]. Mackle T, Meaney J, Timon C. Tracheoesophageal compression associated with substernal goitre. Correlation of symptoms with cross-sectional imaging findings. J Laryngol Otol. 2007 Apr. 121(4):358-61. [Medline]. Hedayati N, McHenry CR. The clinical presentation and operative management of nodular and diffuse substernal thyroid disease. Am Surg. 2002 Mar. 68(3):245-51; discussion 251-2. [Medline]. Agarwal G, Aggarwal V. Is total thyroidectomy the surgical procedure of choice for benign multinodular goiter? An evidence-based review. World J Surg. 2008 Jul. 32(7):1313-24. [Medline]. Newman E, Shaha AR. Substernal goiter. J Surg Oncol. 1995 Nov. 60(3):207-12. [Medline]. Hegedüs L. Thyroid ultrasound. Endocrinol Metab Clin North Am. 2001 Jun. 30(2):339-60, viii-ix. [Medline]. Belardinelli L, Gualdi G, Ceroni L, Guadalaxara A, Polettini E, Pappalardo G. Comparison between computed tomography and magnetic resonance data and pathologic findings in substernal goiters. Int Surg. 1995 Jan-Mar. 80(1):65-9. [Medline]. Weber AL, Randolph G, Aksoy FG. The thyroid and parathyroid glands. CT and MR imaging and correlation with pathology and clinical findings. Radiol Clin North Am. 2000 Sep. 38(5):1105-29. [Medline]. Tsang FH, Wan IY, Lee TW, Ng SK, Yim AP. Management of retrosternal goitre with superior vena cava obstruction. Heart Lung Circ. 2007 Aug. 16(4):312-4. [Medline]. McHenry CR, Piotrowski JJ. Thyroidectomy in patients with marked thyroid enlargement: airway management, morbidity, and outcome. Am Surg. 1994 Aug. 60(8):586-91. [Medline]. Monchik JM, Materazzi G. The necessity for a thoracic approach in thyroid surgery. Arch Surg. 2000 Apr. 135(4):467-71; discussion 471-2. [Medline]. Manders JM, Corstens FH. Radioiodine therapy of euthyroid multinodular goitres. Eur J Nucl Med Mol Imaging. 2002 Aug. 29 Suppl 2:S466-70. [Medline]. Farling PA. Thyroid disease. Br J Anaesth. 2000 Jul. 85(1):15-28. [Medline]. Testini M, Nacchiero M, Miniello S, et al. Management of retrosternal goiters: experience of a surgical unit. Int Surg. 2005 Apr-Jun. 90(2):61-5. [Medline]. Chiang FY, Lee KW, Huang YF, Wang LF, Kuo WR. Risk of vocal palsy after thyroidecitomy with identification of the recurrent laryngeal nerve. Kaohsiung J Med Sci. 2004 Sep. 20(9):431-6. [Medline]. Filho JG, Kowalski LP. Postoperative complications of thyroidectomy for differentiated thyroid carcinoma. Am J Otolaryngol. 2004 Jul-Aug. 25(4):225-30. [Medline]. Hermann M, Alk G, Roka R, Glaser K, Freissmuth M. Laryngeal recurrent nerve injury in surgery for benign thyroid diseases: effect of nerve dissection and impact of individual surgeon in more than 27,000 nerves at risk. Ann Surg. 2002 Feb. 235(2):261-8. [Medline]. Lo CY, Kwok KF, Yuen PW. A prospective evaluation of recurrent laryngeal nerve paralysis during thyroidectomy. Arch Surg. 2000 Feb. 135(2):204-7. [Medline]. Prim MP, de Diego JI, Hardisson D, Madero R, Gavilan J. Factors related to nerve injury and hypocalcemia in thyroid gland surgery. Otolaryngol Head Neck Surg. 2001 Jan. 124(1):111-4. [Medline]. Rosato L, Avenia N, Bernante P, De Palma M, Gulino G, Nasi PG, et al. Complications of thyroid surgery: analysis of a multicentric study on 14,934 patients operated on in Italy over 5 years. World J Surg. 2004 Mar. 28(3):271-6. [Medline]. McIvor NP, Flint DJ, Gillibrand J, Morton RP. Thyroid surgery and voice-related outcomes. Aust N Z J Surg. 2000 Mar. 70(3):179-83. [Medline]. Karlan MS, Catz B, Dunkelman D, Uyeda RY, Gleischman S. A safe technique for thyroidectomy with complete nerve dissection and parathyroid preservation. Head Neck Surg. 1984 Jul-Aug. 6(6):1014-9. [Medline]. Loré JM Jr, Kokocharov SI, Kaufman S, Richmond A, Sundquist N. Thirty-eight-year evaluation of a surgical technique to protect the external branch of the superior laryngeal nerve during thyroidectomy. Ann Otol Rhinol Laryngol. 1998 Dec. 107(12):1015-22. [Medline]. Shaha AR, Jaffe BM. Parathyroid preservation during thyroid surgery. Am J Otolaryngol. 1998 Mar-Apr. 19(2):113-7. [Medline]. Ozbas S, Kocak S, Aydintug S, Cakmak A, Demirkiran MA, Wishart GC. Comparison of the complications of subtotal, near total and total thyroidectomy in the surgical management of multinodular goitre. Endocr J. 2005 Apr. 52(2):199-205. [Medline]. Pattou F, Combemale F, Fabre S, et al. Hypocalcemia following thyroid surgery: incidence and prediction of outcome. World J Surg. 1998 Jul. 22(7):718-24. [Medline]. McHenry CR, Slusarczyk SJ. Hypothyroidisim following hemithyroidectomy: incidence, risk factors, and management. Surgery. 2000 Dec. 128(6):994-8. [Medline]. Miller FR, Paulson D, Prihoda TJ, Otto RA. Risk factors for the development of hypothyroidism after hemithyroidectomy. Arch Otolaryngol Head Neck Surg. 2006 Jan. 132(1):36-8. [Medline]. Piper HG, Bugis SP, Wilkins GE, Walker BA, Wiseman S, Baliski CR. Detecting and defining hypothyroidism after hemithyroidectomy. Am J Surg. 2005 May. 189(5):587-91; discussion 591. [Medline]. Farkas EA, King TA, Bolton JS, Fuhrman GM. A comparison of total thyroidectomy and lobectomy in the treatment of dominant thyroid nodules. Am Surg. 2002 Aug. 68(8):678-82; discussion 682-3. [Medline]. Stoll SJ, Pitt SC, Liu J, Schaefer S, Sippel RS, Chen H. Thyroid hormone replacement after thyroid lobectomy. Surgery. 2009 Oct. 146(4):554-8; discussion 558-60. [Medline]. [Full Text]. Johner A, Griffith OL, Walker B, et al. Detection and management of hypothyroidism following thyroid lobectomy: evaluation of a clinical algorithm. Ann Surg Oncol. 2011 Sep. 18(9):2548-54. [Medline]. Randolph GW, Shin JJ, Grillo HC, et al. The surgical management of goiter: Part II. Surgical treatment and results. Laryngoscope. 2011 Jan. 121(1):68-76. [Medline]. Sancho JJ, Kraimps JL, Sanchez-Blanco JM, et al. Increased mortality and morbidity associated with thyroidectomy for intrathoracic goiters reaching the carina tracheae. Arch Surg. 2006 Jan. 141(1):82-5. [Medline]. Vasica G, O'Neill CJ, Sidhu SB, Sywak MS, Reeve TS, Delbridge LW. Reoperative surgery for bilateral multinodular goitre in the era of total thyroidectomy. Br J Surg. 2012 May. 99(5):688-92. [Medline]. Belmont MJ, Wax MK, DeSouza FN. The difficult airway: cardiopulmonary bypass--the ultimate solution. Head Neck. 1998 May. 20(3):266-9. [Medline]. Saha SP, Rogers AG, Earle GF, Nachbauer C, Baker M. Surgical management of intrathoracic goiter. J Ky Med Assoc. 1997 Oct. 95(10):421-3. [Medline]. Wright CD, Mathisen DJ. Mediastinal tumors: diagnosis and treatment. World J Surg. 2001 Feb. 25(2):204-9. [Medline]. Allo MD, Thompson NW. Rationale for the operative management of substernal goiters. Surgery. 1983 Dec. 94(6):969-77. [Medline]. Mellière D, Saada F, Etienne G, Becquemin JP, Bonnet F. Goiter with severe respiratory compromise: evaluation and treatment. Surgery. 1988 Mar. 103(3):367-73. [Medline]. A vocal cord examination via flexible fiberoptic laryngoscopy. The left thyroid lobe being retracted anteromedially beyond the region of the left recurrent laryngeal nerve (pointed out by metal rod) with Berry ligament still connecting the lobe to the trachea. Midline sternotomy with a self-retaining retractor exposing the mediastinal component of a substernal thyroidectomy. Photograph taken after dissection of gland from surrounding attachments. Thyroid specimens from substernal thyroidectomy. Closure of neck wound with sutures and active drains. Disclosure: Receive consulting fees from Medtronic, Olympus, and Ziteo.